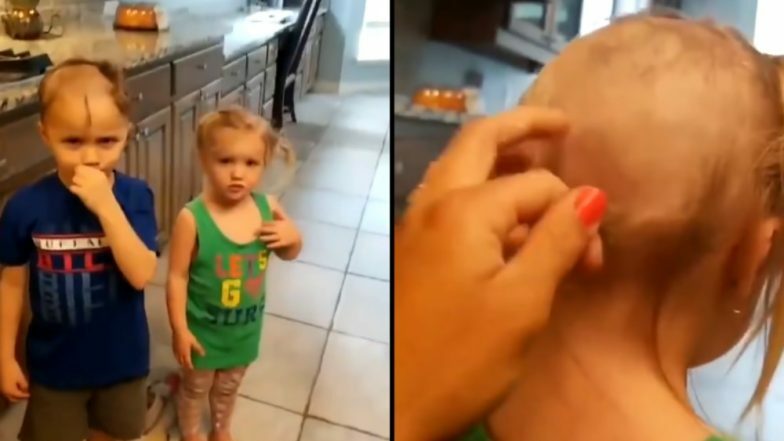 A mother from Texas had the scare of her life on seeing shaven heads of her children recently. Stephie Leigh took to Instagram sharing videos of children who had used an electric shaver to chop off their hair. Stephie who is a nurse begins the video in tears saying that her oldest son cut the hair of his siblings. The video shows Teddy, the older one with a little hair left in the front. And then he turns around to show a clean-shaven head. The video of three siblings went viral after Stephie's brother Ian Hagadorn shared it on Twitter saying, "Y’all, my nephew found the electric razor and went wild.' The post has been liked more than 180,000 times." Then comes Eloise who has some patches left in the front, but the back of her head just like her older brother is cleaned up completely. He was kind enough to let go of her pigtails. Wiping her tears, Stephie says, "OK it's just hair and it's going to grow back and Mommy's OK. Why did you let your brother do that?" He answers saying, "She said she liked me doing that a lot and I did it and we wanted to show you." These Videos of Babies Not Recognising Their Dads After Shaving Beard are Adorably Cute. In the video, Stephie asks Eloise if she liked her new haircut but he replied with a 'No' and says, "Mommy, I look like a boy. Mommy, can you put your hair on my head?" Stephie replies saying, "No you don't look like a boy. You're a beautiful girl. It doesn't matter." Her big brother adds, "Your face looks like a girl." Teddy also confessed that he chopped off his younger's brother's hair. Seems all the three had their heads completely shaven from a salon after the incident.